Clubs are brand new in plastic wrapper or out of the wrapper in “shop worn” condition. Note: Shop worn clubs in most cases have been swung inside of pro shop but have not been used on a golf course or range. Clubs have experienced normal play but have been well taken care of. 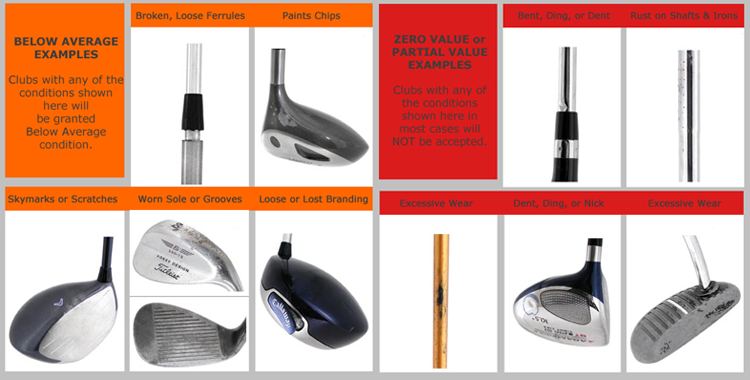 These clubs DO NOT have any paint loss, skymarks of any kind, excessive groove wear, or heavily used grips. 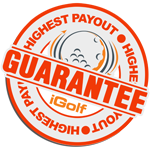 Clubs have experience heavy play and so show cosmetic and component wear. These clubs may have paint chips, skymarks, groove loss, and worn grips. Clubs (below) shown with “Orange” tab should be considered Below Average condition. Clubs shown with “Red” tab should be considered Zero Value or Partial Value. Clubs with any of the shown (below) conditions in most cases will NOT be accepted. Recommendations for receiving full condition submitted credit: Drivers, Fairway Woods, Hybrids, and Putters should include all original accessories. If applicable, include original headcover, fitting wrench/tool, and extra weights.